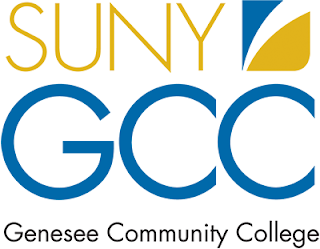 BATAVIA, N.Y. -- Earlier this month, Genesee Community College hosted a special pizza party to celebrate and recognize current students who plan to transfer to a four-year degree program after GCC. In 2017, approximately 40% of the College's graduates transferred after earning an associate degree at GCC. While the transferability of college credits has always been part of the community college appeal, the strive to avoid crippling student loan debt has more and more students jumping on the community college path to get started. "The transfer process can appear daunting to a first-time transfer student," Kristen Hargrave, transfer coordinator at GCC said. "But the SUNY Transfer Paths and articulation agreements between two and four-year schools map out very specific courses to maximize the student's tuition dollars and minimize the number of semesters it takes them to earn their degrees." Once a student decides to pursue a two and then four-year degree program, they should meet with the two-year institution's transfer experts. At GCC, the Transfer Coordinator and other student success coaches consult with the individual student to make sure they register for the exact courses that have been mapped for transfer under the applicable articulation agreement. This allows the student to fill elective slots and other general education requirements with courses that meet the standards of the articulation agreement, effectively maximizing every credit and every semester. The student success coaches and Transfer Center staff are available to the student throughout their time at GCC to ensure they stay on track. In addition to one-on-one planning and consultation, GCC's Transfer Center coordinates numerous information fairs and college visits to help current students find and establish connections with four-year colleges and universities, both within the public SUNY system as well as private institutions. The Transfer Center also works to establish Articulation, Transfer and Enrollment Agreements that guarantee students' specific transfer credits and program admission from GCC to a participating four-year institution. In all, GCC has over 200 such agreements in place at any given time. Recently, officials at GCC entered into three new articulation agreements with the Rochester Institute of Technology (RIT), College of Health Sciences & Technology. These new agreements define and ensure transferability of credits earned in GCC's Liberal Arts & Sciences: Natural Sciences Flexible STEM Concentration Associate Degree program into RIT's Nutritional Sciences, Exercise Science or Dietetics & Nutrition programs. By carefully evaluating course content and student achievement outcomes, the institutions have clearly articulated exactly which of RIT's bachelor degree requirements have been met by students graduating with the defined associate degree from GCC. All of these agreements support GCC's continual efforts to help students achieve their academic and career goals with maximum efficiency. Students looking to take advantage of these or any of GCC's articulation & enrollment agreements, including the SUNY Transfer Program, should contact GCC's Transfer Center at transfer@genesee.edu for one-on-one help establishing their own an academic plan.